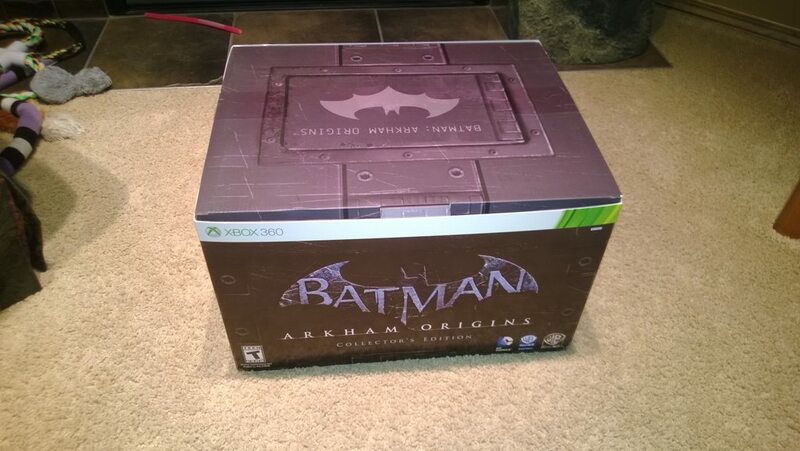 So I picked up the legendary Edition of Batman Arkham origins yesterday. When I went to pre-order the game I was internally content with just ordering the plain jane version but there was an ad showing all the stuff and the Joker statue sold me. I wasn't dissapointed. When I picked it up I honestly wasn't expecting the size of box this came in. So I was going to create this last night but I managed to kind of screw things up. Long story short, I should know better to use the wireless in that part of my house. It works but its weak and that may have been the cause of the 1 hour+ update. I realized my mistake and tried an old cable I had lying around but I think it was too late. Anyway..unboxing time! After removing it from its sturdy brown wrapped container (and after 18$ is custom fees..WTF!??!) the OUYA was packaged in an attractive black box with somewhat shinier black letters that surprisingly spelled out O..U..Y..A..
Read more about My OUYA arrived Yesterday! Calgary Comic & Entertainment expo. Another Comic expo has come and gone here and my feet are still kind of recovering. The Calgary Comic & Entertainment Expo was a blast this year. While it might have been missing some of the draw that it had last year it far exceeded last years in terms of planning. Not a really exciting thing but when you try to shove 50,000 people into a hall all huddled around to meet the nine principle members of Star Trek:TNG and Stan Lee and still sell tickets at the door it becomes a mess fast. Read more about Calgary Comic & Entertainment expo. 4 Days until the Calgary Comic and Entertainment expo! Last year we had the 9 Principle characters/actors from Star Trek: TNG and that was nucking futz. They had something like 50,000 people a day show up and the fire department cam and stopped people from going in. I am not sure how you can top last year but this year I bought a 3 day pass and plan to take my time, explore and soak it all in. Read more about 4 Days until the Calgary Comic and Entertainment expo! So a couple months back we had a Corporate Trainer come up to "train" us. Basically they are lessons in common sense and it drives me crazy. The one point that stuck out in everyones mind is this notion of Above the Line and Below the line. It has to do with how we talk and behave and whether we talk in a positve or negative tone. It has finally come together! A year of planning, 2 years of building and a summer of finishing and I am so close to done I can almost taste the popcorn. Back in 2009 I had a goal, I was going to start and finish the basement by my daughters 10th birthday which is this December. It was the holder of all junk and crap for a number of years and I had a dream of a home theatre room, Projector, theatre seats, popcorn maker, beverage center. I spent a year fiddling with a plan and design that I was going to do.